An Uncommon Má Jiàng Pattern from Fujian? Babcock, Hager and Lethin and the Mah-Jongg Company of China et al. Allan and Lila Weitz Galleries. 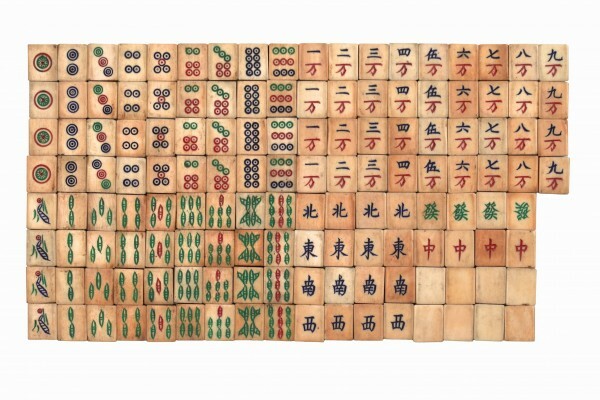 The Origin and Development of the Mahjong Tile Set. Part 1. 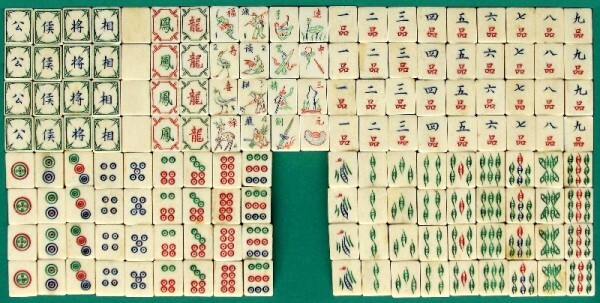 The Origin and Development of the Mahjong Tile Set. Part 2. The Wilkinson tile set, courtesy of the British Museum, Department of Oriental Antiquities (with special thanks to Doctor Irving Finkle), London, was collected in Ningbo, China, 1889 – 1890. The tile set consists of the three Suits, the four Directions and the three Honours, commonly called the ‘Dragons’ in the West. The basic design on the tiles are; an abstracted form of a String of Cash on the number one String of Cash/’Bamboo’ (the late Japanese MJ Museum in Chiba interprets this figure as a ‘Mayfly’) plus pointed ‘leaf shapes’, or coils of string for the rest of the suit (as represented on a late Qing four-suited ma diao playing card set – see in the Money-suited Cards section); a simplified number one Cash/Circles showing two circles and four smaller circles inside the inner circle and multiple circles on the number 2 and 3 tiles with smaller, single circles the rest of that suit. All of these form an overall ‘engraving style’, and coupled with the overall group composition of the set constitute a ‘Tile Set Pattern‘. Sets with this design make-up were made perhaps into the 1930’s. The Laufer tile set, courtesy of the American Museum of Natural History, Department Anthropology, New York, was collected in Shanghai, China, 1901. Despite an approximate 12 year difference, this set’s Tile Set Pattern is almost identical to the Wilkinson set. The important differences, however, are; (1) the engraving style of the Winds/Directions tiles which is more akin to the engraving style of the Winds/Directions found in the Glover sets that were collected 12 years earlier in Fuzhou; (2) the shape of the bone which has a flat top (the Wilkinson set tiles have a concave top surface as do the earlier Glover tiles). This basic composition of tile groups, plus the addition of a different engraving style for some groups, was also found in tile sets made in the 1920s, and even featured in sets (with some additions) exported to the West. Note: An earlier engraving style appearing within a much later engraving style (as in the Laufer set) is called a ‘Relict‘ feature, and the appearance or mixing of part of a Tile Set Pattern (such as another group of tiles with a distinctive engraving style) within another set is called ‘Hybridisation‘. Examples of both of these are found in the Galleries below. This Gallery features bone and bamboo tile sets that have the basic Wilkinson Tile Set Pattern as well as tile sets that have a Hybridisation pattern and Relict features (see the Gallery 1.1 Introduction for explanations of these terms). 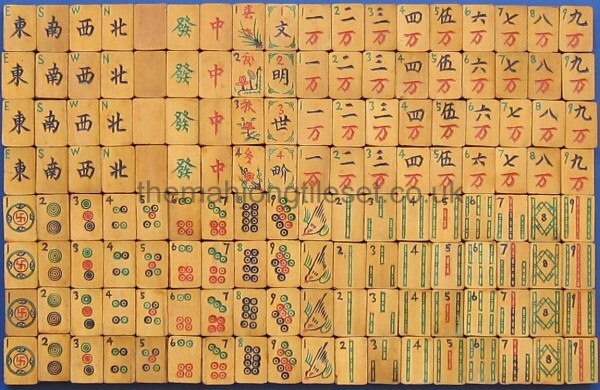 Copyright © The Mahjong Tile Set 2014-2017. All Rights Reserved.